I taught myself about quilting by reading books and watching tutorials on the Internet. One of the first and best tips I found was to dedicate a large part of one wall in my sewing room/studio to a flannel board of sorts, otherwise known as a flannel wall. Who knew that the old teaching tool from elementary school would be my foundation tool for quilt design?! Yet…fabric sticks to flannel so you can place fabric on the wall, stand back and decide if the colors, shapes, and design are working before you sew. Standing back at least 10 feet gives you good perspective. And I continue to do this while I sew and piece a quilt. Since I am often working with fabric pieces that have yet to be cut to the shape/size I want, the flannel board is a very abstract way to get a general idea of whether I like the direction I am going BEFORE I commit too many hours to a quilt creation. Something as simple as putting random pieces of the fabric colors on the flannel and then stepping back, can tell you…YES, this is a go or WHOA…not so much. 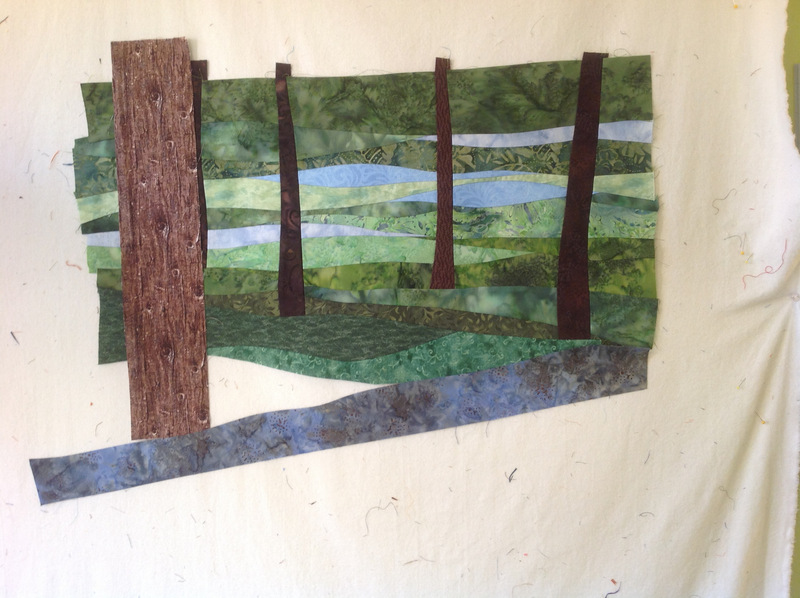 The first picture he re is of the beginning stages of a tree quilt, figuring out whether or not the fabric for the water will work, is the angle what I want and what fabric to use for the next tree to be added. 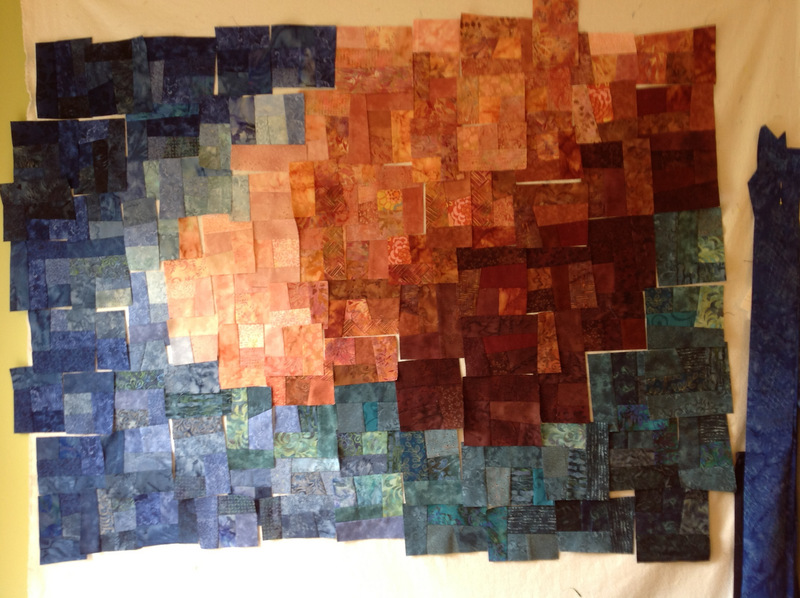 The second picture in my blog is of the creation of another quilt when I was sorting out which way to go with my design. I had an idea to use more random colors and pieces for a section but upon placing pieces on the design wall I saw it was too busy and not what I wanted. The flannel wall saved this quilt!! I shifted to a different design and the finished quilt is awesome. The third picture is a mosaic quilt on the flannel wall in which the colors just didn’t work for me. I ended up using all the piec es but making two different quilts, both of which are pleasing individually but not so much as one big quilt. One of the fun aspects of contemporary quilting is the freedom to design in anyway you want, without the constraining squares or carefully followed patterns. I also use the flannel wall extensively when working on custom quilts in which someone wants a quilt “sort of like….but with some different colors”. 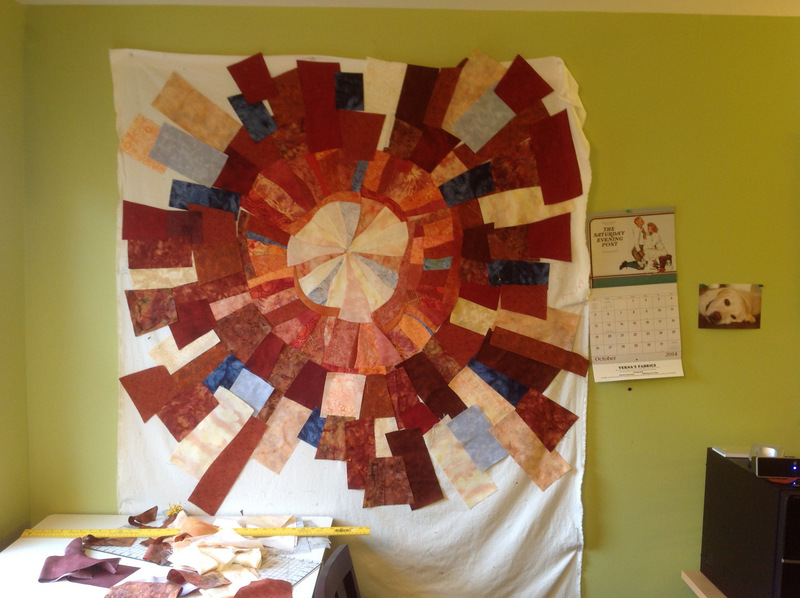 In those situations I will often design the quilt fairly completely on the flannel wall and send photos. It is easier to change some colors before final construction than learn that the colors in the middle are just not right. Finally, I almost always put each quilt as a quilt top on the flannel wall for a day or two as I think about how to quilt it. I am not a stipple all over kind of quilter but rather want to quilt stitch in ways that accentuate the design of the art quilt. So for a few dollars and a few thumbtacks you can create a very important tool for quilt design.